This is an extract from a 3376pp Opus Magnus by Patrick Kelly about the history and present state of play of 'free' energy devices. The interview gives a useful impression of the Keshe paradigm, from an updated PDF dated 2017. He refers to the magnetical-gravitational fields which MTK calls 'plasmatic magrav fields' as Orgone energy, which is possibly a pretty good simile with what we understand by the Orgone of Wilhelm Reich et al. In 2015, an Iranian man called Mehran Keshe went public with his latest design of an Orgone concentrator, showing the construction details and offering completed units for sale. This was not a sudden announcement as Mr Keshe had been discussing energy flow for several years and showing how to construct low-power devices. Faced with the problem which all Orgone builders find difficult, namely, describing a piece of technology in a field where there are no commonly accepted terms, Mr Keshe has invented his own names where none existed. That makes it rather difficult to understand his descriptions, but this is a common problem in this field. Unfamiliar terms such as “Gans”, “Nano coating” and “Plasma capacitor” do tend to put people off and make them wonder if this design is genuine. That tends to make people decide to wait and see if people can make it work. That waiting time appears to be coming to an end now. How do we know that this is an Orgone device? In the page displayed above, you will notice that the first step is “Pray”. That makes people with just basic science training, tend to dismiss the entire matter out of hand. But, as you can see in my chapter 10 entry the “Weird Nature of Water” demonstrates clearly that in free-energy designs, the builder has a major influence on the performance of the finished product. In the case of water, the crystal structure of the frozen water is drastically influenced by the mental state of the human involved. Many years ago there was a report in an electronics magazine about a man attaching a lie detector to the leaf of a plant and then, standing several metres away, he thought of destroying the plant by burning it. The sensitive lie detector equipment displayed major changes caused by his thoughts and the magazine concluded that plants are sentient. Personally, I think that their conclusion is quite wrong and while many plants have protective mechanisms to warn other plants in their species of any immediate threat, I seriously doubt their conclusion. What I think was happening was that the man was transmitting thoughts across the space to the plant leaf which formed a variable resistor sensitive to the thought waves and it was the man causing the lie detector display fluctuations. Either way, it shows the transmitted effect of human thought. The effect is also seen in gardeners who are supposed to have “green fingers”. Those gardeners don’t have special fingers, what they do have is positive mental thoughts about plants and those thoughts influence the plants in a positive way. Another indicator that the Keshe design operates on Orgone is seen in the instructions which come with the units purchased complete from the Keshe Foundation. The instructions stress that before any electrical load is connected to the unit, that there needs to be a three week to five week period while the immediate surroundings become attuned to the energy field of the unit. Remember that the Joe Cell described earlier in this chapter, when attached to a vehicle, can take a week to get the vehicle attuned to the Cell. These things are all consistent with each other. So when Keshe says “Pray” he is completely serious as prayer is a form of meditation which produces positive brain activity which will help the construction steps which follow. If this is new to you, you will find the concept difficult because it does not fit in with the wholly inadequate idea of the universe which you have been fed all your life. It would be nice to think of this as a “lunatic” idea, but unfortunately, it is perfectly correct. Anyway, have we any evidence that the Keshe design can work? The answer is ‘yes’ and we will start with a homemade version as shown by Robert Stubblefield. (ed: there are plenty now under Keshe Testimonials, and golden age of gans FB page etc) He shows his electricity bill, and on 7th January 2016 he comments: This bill is from last month. The reading of 47822 is from 01/02. The reading of 47986 is from 01/07 at about the same time (22 minutes apart). That means I was using an average of 2.875 kilowatts per hour last month (November). Right now (December)I am using 1.366 kilowatts per hour. My savings from using the plasma technology is 1.515 Kilowatts per hour. Interestingly, I have seen it said that an Orgone pyramid placed underneath an electricity meter caused a much reduced electrical reading, so much so that the utility company replaced the meter on two different occasions because of the very low readings. In that set-up, there was no connection to the mains. In the Keshe system, there is a connection in one of four different connection methods. We also have information from John Blanpied of the Volcano Ubuntu Centre in Volcano, CA who shows the initial work on a unit delivered by the Keshe Organisation. This shows that the Keshe Foundation is actually producing devices and shipping them to the people who purchased them. It is too soon to be certain of the genuineness of Keshe or to assess the performance of his designs, but it looks very promising at this point in time. Q: I've not seen any reports of the performance of this technology by anyone besides Aleks. A: There are several workshops where the initial testing was performed "on air" over time. There are many knowledge seekers who have built and tested these units in a limited fashion. This is very new technology, but using very old concepts. Q: But it is a huge problem for most people. How do you plug a little box into your house to run your house off it ? A: I can understand how folks can get confused with the claims. It is necessary to understand, that what this box does is totally different from what folks are used to thinking about. The electricity output is a by-product of the technology and not the primary energy. The primary energy is vastly different from anything conventional physics has worked with in the past. 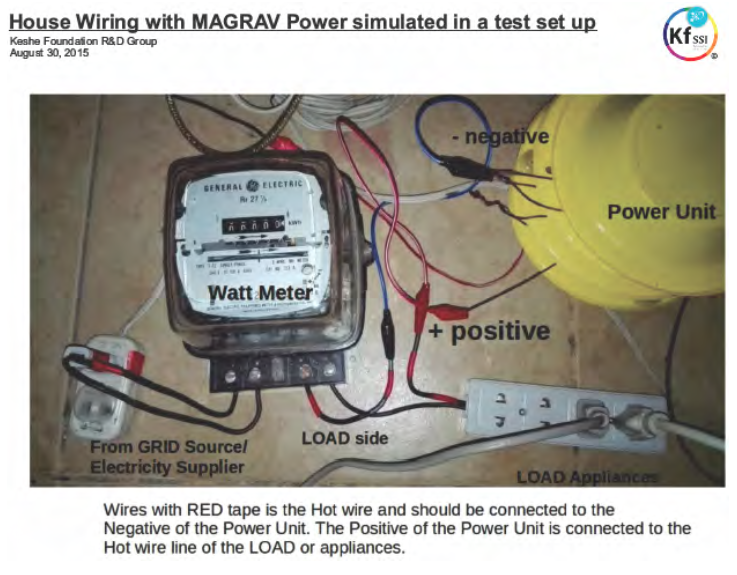 Q: Do any of you know anyone who has either replicated this for themselves and are now powering their house or car with it, or who has installed one of the Keshe Magrav systems which they bought, and have been powering their house or car with it ? A: I know many people who have replicated this technology in various forms with generally good results. I myself have made limited systems and have tested them, although my understanding of them is not complete. Remember, you cannot compare these systems to a "generator" or electricity supply. They work on an entirely different level. Q: We have no information about how user-friendly this is. Is it just a matter of plug-and-play, or does it require a specially trained electrician to install it ? And once it's installed, is it fully functioning, or is there a period of "conditioning" ? A: This is initially, a plug and play system. You plug one end into a wall socket (or between your electric meter and the circuit breaker box) and it begins to condition what you plug into the other end (or your whole house) to accept and function with the plasma energy. It does take a little while for the system to come to full operation, but even so, some appliances will work off it straight away. Q: From what I gather from bits and pieces which I have heard, there is a "conditioning" period, and it doesn't power all appliances. For example, if I heard correctly in the previous video, it won't power Compact Fluorescent lights, which almost everyone has in their homes now. So how does that work? How feasible is this for people in the Western world actually using it in their homes right now? A: The reported limitations of the initial units is with resistive loads. These are loads such as electric heaters, electric stoves, filament light bulbs and such. If I understand it correctly, capacitive or inductive loads operate perfectly. There will be some time of discovery for many to see the precise requirements and limitations inherent in the Keshe plasma system, but the benefits are far beyond the inconveniences. Resistive loads will still be operational, but only to around 3.2 kW. This is due to the nature of the conversion of plasma into resistive capable electron flow. Q: If it requires input from the mains to produce power, will it work when the grid goes down? Keshe says “Yes”. How can that be? A: The input from the grid is used as a signal for the unit to know what form of electricity to output. Barring using a resistive load on the output there is no energy drawn from the grid. If a resistive load is used, only a small percentage of mains energy is used. The next generation units will not require a mains connection. Q: The plugs going to and from the Magrav Power system are Italian connectors. Converting that to other similar power systems is just a matter of using the proper adaptor. But what about when converting it to power systems that are different? Keshe says that this is not an issue? Has that been demonstrated successfully? the same output socket strip and functioned correctly at the same time. No converter was necessary other than the physical plug connections. It is possible to power a cell phone, an air conditioner and a fridge from different countries from the same plug with this technology. It does not have the limitations of "electricity". Q: What about vehicle applications? How does that work? What kind of success have people had implementing the Magrav technology in that application? I understand that it is supposed to even work on non-electric vehicles. How doe it do that and how well does it perform? A: The "how" of this question is a bit complicated and does require some relearning of how matter and energy interact. In a very basic explanation, the plasma employs forces identical to how the universe operates. There are no engines on the Earth to keep it spinning and orbiting the Sun. It is the interaction of magnetic and gravitational fields which provides the energy for that system. The plasma is a harnessed and directed combination of these types of fields and that can impart its energy into any "matter" (or non-matter) system. Since everything is made of this same plasma, contrary to what conventional physics would have you believe, it is not difficult to see and plan interactions as needed, once one has surpassed the "matter" limitations. Q: Do you know of any reports from people who have implemented this technology ? A: There are, to be bold, millions of folks around the globe creating and using plasma based systems for everything from agriculture, food replacement, motive force, healing and pain control, fuel efficiency increases, home heating load reduction, as well as other fields. We are only beginning to see the potential uses and benefits of plasma technology. There are many Facebook groups with folks offering their research and ideas freely and in the spirit of cooperation, in order to advance this technology as quickly and as broadly as possible. On 26th October 2015, the details of the plasma energy unit will be released, barring unforeseen events, in which anyone will be able to replicate the units in their home. It will require no special tools or knowledge, though a basic understanding of the nature of the technology is certainly helpful. It is a very simple technology in practice, once one surpasses the limited thinking of conventional physics. There is even a pre-school girl in China who is creating basic systems on her own. This technology replicates what is done in nature and the universe as a whole. It can be done with simple tools and items scrounged from the forest, junkyards and such.